Do YOU want to be a Blue Man? … believe me, it will be worth it! YES… I am back up to date again for January at least… Still have a few technical issues but most of them are solved again… enjoy the pix! Some of you may have noticed that I haven’t been updating my blog or official site lately…. this is due to server problems I have been experiencing for a while… but hopefully they will be ‘cured’ in the near future… I have LOADS of new photos from my stay in Berlin so check back soon for that…. 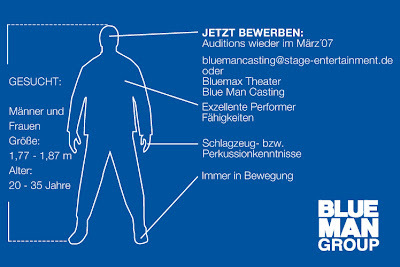 also I start rehearsals for the new Blue Man Group production in Oberhausen next Monday…. exciting stuff!